BizNet OnLine Magazine, I've Fallen, And I Can Get Your Business Up. I've Fallen, And I Can Get Your Business Up. Sometimes, it's the timing that makes a good story a great story. In this case Xerox just announced a price drop on two of it's printers, the DocuPrint M760 and the WorkCenter M950. Here at BizNet we have been playing with these two printers for about 3 months. Now if your a printer, then you really don't want to play with us. We don't play nice. We pull your power cord as your printing, we bend and crinkle the paper before putting it in. We will run you day and night. Just to see if you have a break down we will start you printing at 7:00 a.m., and keep feeding you paper till 6:00 p.m.
Now if you can't take it, and don't empress us, we don't tell anyone about you. In the case of Xerox's DocuPrint M760 and the WorkCenter M950, we get to tell the world about you. Now back to those price cuts. 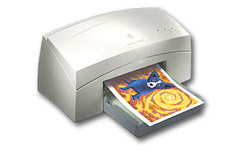 When we started to work on this article the DocuPrint M760 was prices at $199.00. Xerox just dropped that price to a low $149.00. Not bad for a printer that can go up to 1200 X 1200 printing. What is more impressive is the WorkCentre M950. The WorkCenter M950 was priced at $499.00. It is now priced at the low price of $249. Wow that's a cut of over $200.00! The price drop on the WorkCenter M950 is so drastic, that unless you can't conceive of ever having the needs for all of it's extra features, I can't see anyone buying the DocuPrint M760, when for $100.00 bucks more you can get the WorkCenter M950. Both the DocuPrint M760 and the WorkCenter M950 are the same basic printer at hart. The WorkCenter M950 is beefed up with a lot more bells and whistles to make it a great all in one office machine (I still say even for home usage go the extra $100.00) Both printers have a feature I really like. Each print color has it's own print cartage. So if you used up all the red ink, you just replace the red ink. You don't have to throw out the yellow and magenta colors, like you would with a printer that uses a "tri" color printer cartage. This makes the unit much more economical to operate. Now if you only go with the DocuPrint M760 instead of the M950 you don't get the Color Scanning and Coping features. As the M950 is only $100.00 more then the M760, do yourself a big favor. Spend the extra money and get even more value for your money. For being such a great value at it's new super low price, BizNet OnLine Magazine gives the WorkCenter M950 the WOW Award!.